Should You Buy Google’s Nest Learning Thermostat? Thermostats are just one of the many household items to get a smart upgrade in the recent push toward home automation and interconnectivity. Is it worth getting a smart thermostat though? Read on as we review the Nest Learning Thermostat and tell you what we think after three months of living with it. What Is the Nest Learning Thermostat? 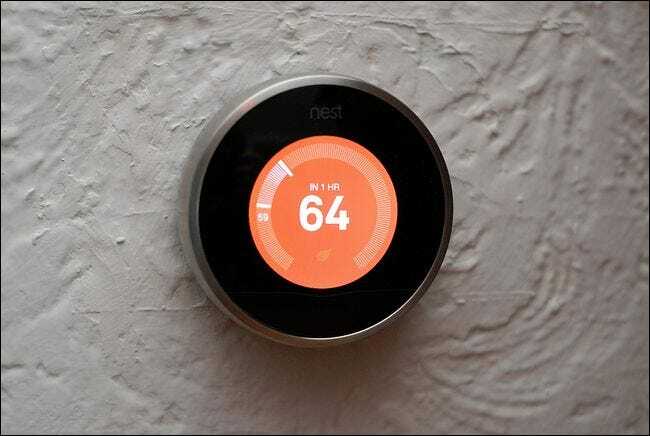 The Nest Learning Thermostat is the creation of Nest Labs, a home automation company located in Palo Alto co-founded by former Apple engineers Tony Fadell and Matt Rogers (it isn’t coincidental that the Nest has a sophisticated system hidden beneath a very simple interface is such and iPod’esque way). The company was later acquired by Google and is now a Google property. It’s shaped like a modernized version of a traditional round-dial thermostat and eschews the box shape of late 20th century programmable thermostats designs (and the later smart thermostat designs that kept the large rectangular shape). Among all the features available on the Nest the most advertised feature and the one that’s a part of its very name is the learning aspect. Programmable thermostats save money, there’s no doubt about that, but they don’t save money if you never program them or if you constantly use the home function to override the programming. With the Nest there is no need to manually program the device because it learns your routine just by hanging out on the wall and even when the program changes on the fly (like you spend your entire Saturday at a festival downtown) the Nest automatically adapts and save you money on heating and cooling while you’re out and about. That all sounds pretty great but you can pick up a cheap (albeit annoying to program) programmable thermostat for $50. Do the smart aspects of the Nest justify its $250 price tag? We installed one (along with the Nest Protect smart smoke detector) three months ago. Let’s take a look at the installation process, the initial setup and learning phase, and what we have to say about life with a learning thermostat after a bitter cold winter and the slow arrival of spring. In most cases installing the Nest is as simple as taking your old thermostat off the wall and swapping out the wires from the old terminals to the new terminals on the Nest’s handy baseplate. We spent more time patching up holes from the old and larger thermostat and painting away its old footprint (the previous homeowners had simply painted around the thermostat leaving a lovely mid-century paint job behind) than we did actually affixing the Nest baseplate and connecting the wires. If you’re comfortable with simple home DIY projects and you trust yourself to mark wires, clean/strip the wire tips, and reinstall them in the correct spots then it’s really about as simple as installing a new media center receiver or the like. You just remove the old thermostat, make note of which wires go to which terminals on your old thermostat, and then insert those wires into the matching terminal points on the Nest base, seen mounted on the wall with the wires installed in the photo above. 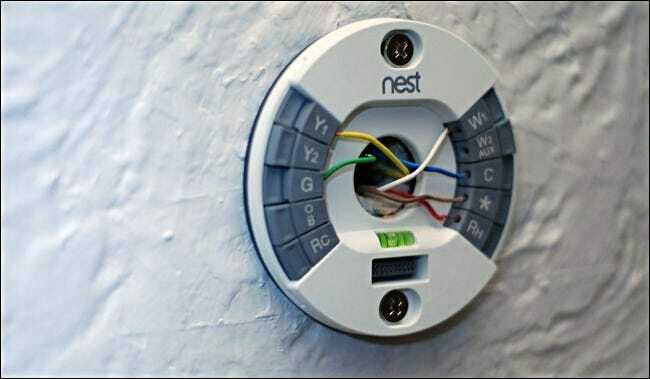 With the wires inserted you just snap the Nest right onto the base and then follow the onscreen instructions. These instructions guide you through connecting the device to your local Wi-Fi network, selecting your fuel source (gas, electric, oil, etc. ), what kind of furnace you have, and so on. What seems like a DIY walk in the park to us might not seem so to everyone else so we’d encourage you to check out our full setup guide, and watch this simple setup video courtesy of Nest to gauge your comfort level. If you’re not comfortable with the physical installation of the device or the setup process both can be completed by an HVAC specialist (and you can even find a Nest-certified specialist via the Nest website). Once you have the Nest installed you can now access the device both by visiting home.nest.com and logging into your Nest account or by the official iOS/Android smartphone apps. We’ll take a closer look at these in a moment. The user interface is, thankfully, identical across both the mobile apps and the web control panel so consider all screenshots and the features they’re demonstrating to be interchangeable. You know what we hated the most about our old programmable thermostat? 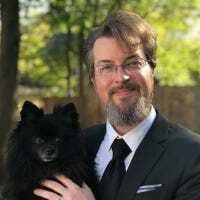 Even if you had memorized the arcane and numerous button combinations required to program the device it still took a significant amount of time to reprogram it which meant you were left standing there in the living room, your arms losing feeling, poking away at it for 15 minutes or longer anytime you wanted to do any significant reprogramming. With the Nest you can set a schedule if you so desire, but we’d recommend not even bothering unless the need arises. You see, immediately after installation the Nest starts keeping tracking of when people come and go in your household. You don’t even have to think about setting a program because it will quickly learn that after 8AM everyone is at work or school, that the first of the kids get off the bus and enter the home around 3:30PM, and by 10PM everyone is in bed. Within a week it’ll have the general activity levels of the house down pat, and you won’t have even had to have bothered with the “what time do we actually leave the house every morning?” game because it already figured it out for you. We purposely didn’t fiddle with the manual programming or settings on the Nest at all for almost a month after we installed it expressly to see if this learning trick was all it was cracked up to be. Without a hitch the Nest picked up on the two critical things: when we were home and what temperature we liked it. Before the end of the first week it already knew what time to turn the heat on in the morning, what temperature to keep it during the day, and what time to dial the thermostat back in the evening. By simply adjusting the thermostat to our preferred comfort levels a few times a day (when waking, coming home, and going to bed) the thermostat learned our preferences and automatically started making adjustments. This screenshot of the energy use in early February highlights both how effective it was and how great the Nest is at communicating with the user. On Thursday and Friday we were home for most of the day. On Saturday we were gone most of the day (but made no adjustments to the Nest). It went into auto-away mode and saved us a significant amount of energy in the process. On Sunday we also enjoyed savings, but we can distinguish between the two entries with the handy icons. The Saturday icon, the little house, indicates that the savings occurred because of the auto-away feature. On Sunday, however, we were home and the savings occurred because the day was unseasonably warm. These kind of simple indicators make it really easy to see when and where changes in your behavior (and the help of the Nest) are actually yielding results. Eventually, you may find that you want to manually tweak or even override the schedule the Nest has learned. No problem. Unlike the huge pain and button-clicking frenzy that is programming an older style programmable thermostat you can simply open up the “Schedule” function in the control panel and adjust to your heart’s content. Once you’re inside the schedule it’s about as simple as can be. You can adjust the temperatures easily, create multiple temperature points, copy and paste existing entries, and otherwise very easily manipulate the programming as if you were using a nice digital calendar. We’re not going to lie, we hated the kludgy 1990s-era button-fest that was our old programmable thermostat so much that even if this was the only feature the Nest offered (automatic programming via learning and easy web/app-based programming) we’d still buy it all over again. But that’s not even the end of the feature set! Let’s take a look at the more advanced features hiding out in the configuration menus. The big thing with the Nest is simplicity. It has a simple interface (both hardware and software) and it does a whole lot on your behalf specifically to offload the tedium of programming and managing your HVAC system. That said it’s most certainly not light on features. Packed inside the that little glossy hockey-puck sized container is a little powerhouse of heating, cooling, and humidity management. Found under the “Thermostat Settings” menu there are more than a few “How did I live without this?” features to explore. The heart of the Nest’s learning and smart features is found there, the Nest Sense system. 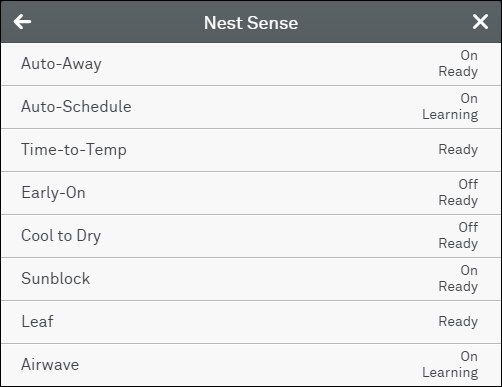 If you open up the Nest Sense menu you’ll find entries for the various Nest Sense features that really make the Nest shine. Let’s go through them now. Auto-Away: We’ve talked fairly extensively about this feature already. Auto-Away allows the Nest to adjust your heating and cooling needs based on whether or not your home is occupied. You tell it how cold it can go in the winter or how hot it can go in the summer and anytime it senses you’re not home it’ll dial back the thermostat on your behalf. You can turn this feature off if you have a pressing need to do so, but it’s great feature that has already saved us the equivalent of days worth of heating this winter. Auto-Schedule: Again, this is another feature we’ve already talked more than a little bit about. Auto-Schedule is the smart learning feature, and if you turn it off the Nest will stop learning your routine. Again, unless you have pressing need to turn it off we recommend you don’t. Auto-Away and Auto-Schedule are really the crown jewels in the Nest system. Time-to-Temp: As the Nest learns your home and your heating and cooling system it begins constructing an algorithm to determine how long it takes to heat and cool your home based on the internal and external temperatures. This particular feature can’t be disabled (nor would you really want to disable it as it makes the Nest better). Because of this feature the Nest’s interface will tell you exactly how long it will take to heat or cool your home when you make an adjustment. Spin the dial from 58F to 70F, for example, and it will tell you that it should take about three hours and 40 minutes to make the adjustment. Early-On: This particular feature isn’t, unlike nearly every other Nest feature, environmentally friendly. It is, however, extremely cool. The Early-On feature combines the thermostat’s schedule with the knowledge it has gained via the Time-to-Temp feature. This way it knows exactly when to start working to achieve an optimum temperature. Thus if you told the Nest (or the Nest learned) that you came home from work at 5PM and you wanted the house to be 70F it would know exactly how early to begin working on heating or cooling the house to achieve the optimum temperature right when you walked in the door. It’s not exactly energy efficient (as it’s making adjustments to the temperature while you’re either asleep or away) but it is very cool, and it’s exactly the kind of feature we’d expect from a smart thermostat. Cool to Dry: Cool to Dry uses your home’s air conditioner as a dehumidifier to purge humidity from your home and make things more comfortable in hot and humid weather. Obviously running the AC isn’t cheap or environmentally friendly but it does get the job done and make your more comfortable. This feature varies from just plain old running the AC to cool the room because it also factors in the internal humidity level of the home via sensor in the Nest so it will run even if the room is cooled to the appropriate level but the humidity is high. Sunblock: Early iterations of the Nest had issues with direct sunlight screwing up the temperature readings. In fairness to the Nest this would screw up readings for any thermostat and putting a thermostat in direct sunlight is a terrible plan. That said if you do have a thermostat placed in direct sunlight and you don’t want to move and rewire it, this feature will allow the Nest to adjust for the problem. Leaf: Leaf is another feature, like Time-to-Temp, that is always on. The Leaf system helps you make environmentally friendly/money saving choices. Every feature in the Nest that saves money features a little Leaf icon. The Leaf turns green when you’re saving fuel/money and it dims when you are not. In addition a Leaf icon appears on the Nest’s face when the thermostat is adjusted into an energy saving mode to indicate that you are saving money and using an environmentally friendly mode. Airwave: Airwave is yet another “The future is now!” cool smart thermostat feature. Traditional thermostats will only run the furnace fan while the AC is running. When the AC stops, the fan stops. The Airwave feature continues to run the fan for a period of time after the AC is no longer active to help distribute cooler air throughout your home. Like the idea of using the fan for such purposes? There’s also a Fan Timer function on the main Nest settings menu that allows you to run the fan for X amount of time (or schedule it to run every Y number of minutes for X amount of time). Before we leave the feature list, there’s another handy feature tucked away. If you have a whole house humidifier, like we do, the Nest doubles as a humidistat and will use local interior readings combined with the average outdoor humidity for your zipcode to automatically adjust your indoor humidity. If you currently have a manual humidistat this is an incredible improvement over your old system. Even if you have a newer humidistat with an exterior probe this is still a huge improvement as issues that can arise with the probe (sun exposure, buried in snow, etc.) are no longer applicable. Although the focus of this article is the Nest itself, we also installed a Nest Protect ($99) shortly after we installed the Nest. The Nest Protect is a smart smoke and carbon monoxide detector that interfaces with the Nest thermostat. 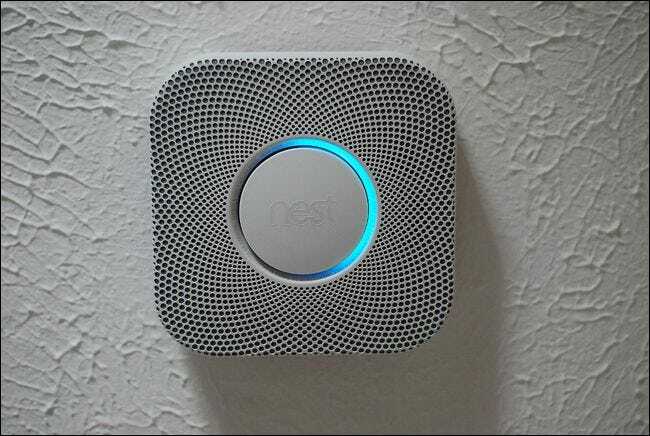 In addition to offering smoke and carbon monoxide detection the Nest Protect also acts an extension of the Nest Sense system and will function as an additional input for the auto-away function. If you have a large home or even if the Nest is in a lesser used room of your home, it can be quite useful to add in a Protect unit. Because our Nest is located in our living room (a fairly low traffic room) we found that the presence of the Protect at the top of the main staircase in the home significantly increased how accurate the home/away function was because the stairway saw much more traffic than the living room. The Protect is illuminated during configuration and alarms. In addition to simply extending the Nest system the Protect shaped up to be the most pleasant smoke detection system we’ve ever encountered. Not only does it sound a regular alarm, but it also gives natural language input like “There is smoke in the hallway” or “There is carbon monoxide in the living room” in between the alerts. If you have more than one Protect this alert and natural language input is broadcast to all of them so no matter where you are in the house the alerts are clear and informative. Further, these alerts are passed onto your smartphone and emergency contact phone as well as stored in the web control panel for review. Finally the Protect sports a really fantastic behind the scenes feature that could, no hyperbole here, save your life. When the Protect detects carbon monoxide it also simultaneously, thanks to its link with the Nest thermostat, kills the heating system in the house. Given that a significant number of carbon monoxide related deaths are caused by faulty combustion based heating systems this smart interplay between between the detector and the furnace means that even if you cannot hear the alarm or are incapacitated the removal of the probable source of the carbon monoxide buys you precious time. Given the extra functionality you get with the Protect (fire detection, carbon monoxide detection, and extension of the Nest Sense motion detection) it’s practically a non-decision to purchase the device if you have a home over a thousand square feet, if the thermostat is not centrally located, and/or if you need to upgrade/update your existing smoke alarm. After seeing how well it supplemented the Nest Sense features as well as how easy it was to setup and how useful it is (compared to the simple “dumb” alarm of a traditional detector), we’re totally sold on it. We’ve installed the thermostat and the smoke detector, we’re three months into the experiment and our pocketbook is $350 lighter ($249 for the Nest and $99 for the Protect). Was it worth it for us and is it worth it for you to upgrade to a smart thermostat? The short answer: yes, for homeowners. Hands down, without a single doubt, upgrading from an older non-programmable thermostat to a programmable thermostat is a wise choice. The problem with programmable thermostats (which is the problem the Nest seeks to avoid) is that people simply don’t use them. They’re a pain to program, they’re a pain to adjust, and more often than not despite having a serviceable, albeit clunky, programmable thermostat people simply give up on them and use the Home button or the Vacation setting to permanently set a temperature. Good technology reduces friction and that’s exactly what The Nest did for our household. Everyone knows what you’re supposed to do to save energy, help the environment, and lower your heating and cooling bill but very few people actually do it and even those that have good habits in regard to their thermostat certainly do religiously adjust the thermostat in the manner in which the Nest can do so. Based on both our rough calculations and projected estimates from the Nest company, the thermostat should pay for itself within two years. We’ll be frank with you though, even if it didn’t pay for itself in twice that amount of time we’d probably still have gone ahead and installed it simply because its proven to be so convenient, so easy to use and, more importantly, it actually made us care about what was going on with our heating and cooling system. A product that not only reduces the friction of a previously unpleasant task but also makes you care about the task and want to interact with said product is definitely a product worth buying. When is the Nest not worth investing in? At this point we can’t imagine having a house without a smart thermostat but there are plenty of people for whom the Nest simply wouldn’t be as wonderful an upgrade as it was for us (or even possible). If you rent and you cannot replace the thermostat, you’re out of luck. If you’re already extremely diligent about monitoring and using your thermostat you won’t necessarily see huge savings (but you will gain the ability to remote control your thermostat, tract energy use, and other perks). Finally, there are some people who simply don’t want to have components of their home connected to the Internet nor would they want their thermostat company (owned by Google at this point no less) to know if they were home or not. While we don’t share those concerns they certainly rule out a smart thermostat purchase in such cases. Outside of those considerations, however, we’ve been hard pressed to come up with a reason why you wouldn’t want to upgrade. Before we leave the subject, if you’re on the fence because of the expense, we’d strongly encourage you to call your local utility company and see if there is an energy saving rebate available for the installation of the Nest. The Nest qualifies for programmable/wi-fi thermostat rebates in many locations (our local utility offers a $50 rebate for anyone upgrading from a standard thermostat to a smart thermostat) and while searching for additional information on rebates we even found some utility companies in the U.S. offering a free Nest thermostat. Reliant Energy, for example, has a partnership with Nest and any customers who sign up for their Learn & Conserve plan get a free thermostat. A little extra research can save you anywhere from a few bucks to the total cost of the upgrade. Have experience with the Nest thermostat or other smarthome upgrades? Join us in the How-To Geek forum and share your knowledge.